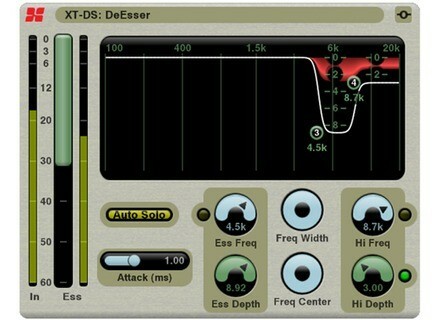 XT-DS De-Esser, Software de-esser from Harrison Consoles. Harrison Consoles announces the update of its DAW with two new pre-installed de-esser and expander/gate plug-ins. 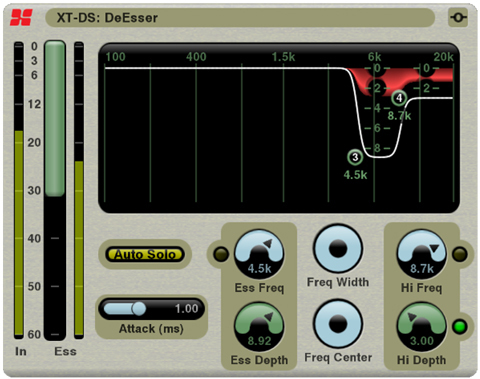 The XT-DS De-Esser is designed to remove the sibilants from your vocal tracks. Harrison adds that their proprietary algorithm will only remove what contributes to the sibilances and will ignore all the “energy” in the “ess” frequency band so your track won’t be altered. The plug-in features redundant controls for easier workflow and you can visually adjust on the graph the frequencies and “ess” and high frequency bands. Last, an Auto Solo function will solo the frequency bands. The second plug-in brought by this update is the XT-EG Expander/Gate, designed for noise gating and track dynamics enhancement. The Expander section includes, Ratio and Knee controls. Each plug-in is available for $109. Note that if you purchase two or more plug-ins in the same order, you’ll get a $25 discount off each plug-in. More information at harrisonconsoles.com. Native Instruments launches Lucid Mission Maschine 2 and Massive users can now complete their sonic rhythmic arsenal with the new Native Instruments Lucid Mission collection. 48 hour sale at HoRNet HoRNet has launched a 48 hour special offer during which you can purchase the SW34EQ plug-in at half price. Win a Waldorf/CME bundle Waldorf partnered with CME to offer a lucky winner a hardware/software bundle.